Tony Blair has launched a robust defence of the government's plans to shake up schools in England, saying he is "restless for change". He said the reforms would help poor children reach their potential. His key speech - in Sedgefield - comes amid warnings of a possible rebellion by up to 100 backbenchers when the plans come to the Commons next year. He wants schools to take on greater powers over their finances, staff and - most controversially - admissions. The Prime Minister said the creation of what will be known as "trust schools" was vital to Britain's economic success and to social justice. He would not rest until the government had done all it could to improve the situation of children from poorer backgrounds who were under-achieving. "While there remains schools - hundreds of them - where fewer than half of children get the results they need at 16 - I cannot rest and will not until we do all in our power to change that failure," he said. Opponents fear the plans would allow schools to return to selecting pupils based on academic ability. But Mr Blair said trust schools would have to abide by existing rules on fair admissions. He appealed to traditional Labour values in his defence of the plans, emphasising the improvements to literacy, numeracy and to GCSE and A-level results since 1997. The reforms that helped bring about the improvements, including specialist schools and academies, had not been brought in without difficulty either he said. As well as fears about academic selection, there are also concerns that trust schools will create an educational hierarchy, with the best schools creaming off the best pupils while others are left with those no one wants. Critics say the middle classes will benefit most and elected local education authorities will lose their power. Mr Blair said the plans would benefit working class children, who had traditionally suffered most in the education system. "The plans will ensure that the choices now exercised by the fortunate and well-off can be given to all parents," he said. "Education and knowledge is the only route to prosperity. "For a young kid in the inner city of London or Manchester or Newcastle and a young child growing up in the old pit villages and mining communities of County Durham education is the liberator. It's the gateway. It's the only thing that can transform their lives". His critics argue that allowing schools the freedom to run their own admissions policy will inevitably lead to selection and are calling on Mr Blair to leave responsibility for admissions with local councils. The speech was Mr Blair's first since the government's commons defeat on anti-terrorism legislation, which led to claims his authority had diminished. Political correspondents estimate as many as 100 backbenchers might rebel over the schools measures unless changes are made. David Cameron, the Conservatives' education spokesman, said the reforms did not go far enough. "The Prime Minister set out his tired and rather half-hearted reforms, which will not deliver the changes that we need to raise standards in schools," he said. 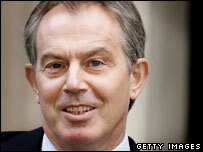 The Liberal Democrats' spokesman on education - Ed Davey - accused Tony Blair of being confused over his own plans. "He's very confused and the White Paper is very confused and incoherent. And I think that's why so many people are worried. "They think he has a hidden agenda of selection, of allowing schools to choose their pupils and I think that's why the Labour backbenchers are revolting and why Mr Blair is increasingly looking so isolated."